Zulu Masters Edition DJ software is a professional audio mixing and DJ software for Mac. 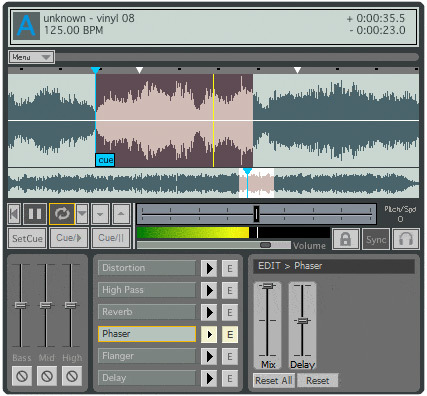 This professional DJ software lets you mix music and other audio recordings live. When loading a music track onto a deck Zulu will automatically scan the file for a beat and assign a beat per minute (BPM), and will change the tempo in the second deck for perfect synchronization. Drag and drop music into and around the application's interface and preview an upcoming track through headphones via a secondary audio output. ~Crossfade in between two tracks. ~Change the pitch in real time of each track, slow it down or speed it up to manually sync it with the other tracks. ~Add a cue pointer marker at any point in a track to instantly start playing the track from that point. ~Loop sections within a track and synchronize that loop to the BPM. ~Real Time Equalization on each Deck (track) including "kill" buttons for instant EQ. ~Apply effects in real-time to a track. ~Effects include Distortion, High Pass Filter, Reverb, Phaser, Flanger and Delay. ~Simple and intuitive user interface for day-to-day operation. dupeGuru Music Edition for Mac (Popularity: ) : dupeGuru Music Edition is a useful tool designed to find duplicate songs in your music collection. dupeGuru Music Edition can also help you scan tags, filenames, or contents. Wavepad Masters Edition for Mac (Popularity: ) : WavePad Sound Editor for Mac OS X lets you record and edit voice and other audio recordings. You can cut, copy and paste parts of recording and, if required, add effects like echo, amplification and noise reduction. Aimersoft DVD Converter Suite for Mac (Popularity: ) : Aimersoft DVD Converter Suite for Mac is the most powerful Mac DVD and video Converter software that include two almighty Mac converters: Aimersoft DVD Ripper for Mac and Aimersoft Mac Video Converter. Zoomin (Popularity: ) : Struggling with email overload ? Need help organizing your inbox? Zoomin is a solution designed to help managers and executives focus on what's important. JIM for Joomla (Popularity: ) : Mod JIM JoniJnm Edition. For be used with the component.